Don’t let the bright lights and “special offers” fool you! · 3 FOR 2 ON SPA TREATMENTS – THIS OFFER IS ONLY VALID ON EMBARKATION DAY! · 60 MINUTES OF FREE WI-FI WHEN YOU BUY ANY INTERNET PLAN – THIS OFFER IS ONLY VALID ON EMBARKATION DAY! · SAVE £10 PER PERSON AND BOOK YOUR TABLE AT OUR ONBOARD SPECIALTY RESTAURANT – THIS OFFER IS ONLY VALID ON EMBARKATION DAY! · EMBARKATION DAY SPECIAL: CASINO CHIPS 50P ALL EVENING ALL TABLES! Are you seeing a pattern emerge? I will admit that some offers you will only ever see on embarkation day, but they’re not spectacular to the point where you must take advantage of them all. This is where the do’s and don’ts of embarkation day come into effect. If you would like to use the internet during your time onboard, then I would suggest that you DO take the special embarkation day offer. I’ve sailed on many cruise ships with many lines and I admit, the embarkation day Wi-Fi offer is quite often the best you will see. Usually, you either get a big chunk of free Wi-Fi time, or the more expensive packages are heavily reduced. Either way, if you can’t face being disconnected, this is the time to set yourself up with one of the packages. I know the thought of fine dining and relaxation is already calling to some of you before you even get to the ship, but if you want to use the spa during your cruise or would like to book a table for one evening in the onboard specialty restaurant, then my advice is to be patient and watch your daily programme. Most of the time, the embarkation day offers are good, but you’ll see them repeated (probably more than once depending on the duration of your cruise) and you might even find that a different offer would be better for you, such as a free bottle of wine in the restaurant or a spa package that includes 3 treatments for less than £60. 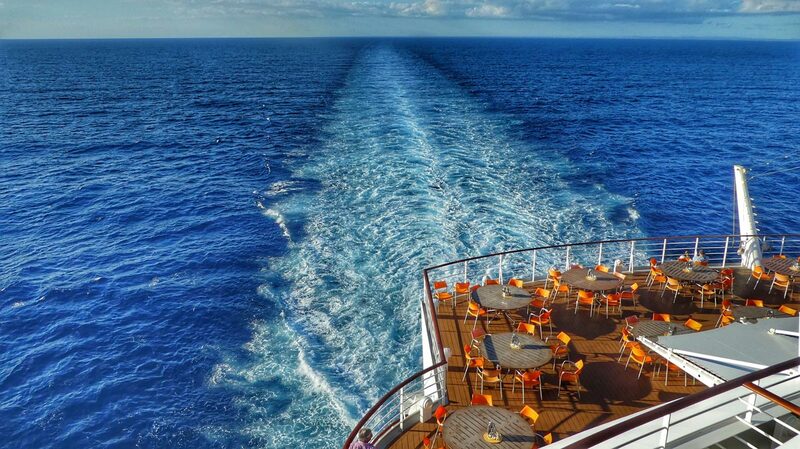 Regardless of what you do on day one of your cruise, always remember to pace yourself and not jump onto every offer you see, not to overspend in the bar or onboard shops and not to over indulge on all the rich and tempting food. The same things will be there, waiting for you, the next day and the day after that, you don’t have to grab it all in the first 24 hours. What should you do on your first day onboard? You should explore, absolutely visit a bar (or two), allow yourself to switch off from the rest of the world and fall into holiday mode – for me that means flip flops during sea days, come rain or shine.